This is one of the brightest and best road legal bulbs. Please note however that if you drive with your lights on for a couple of hours each day the bulbs will probably last less than 12 months. These bulbs are a fantastic improvement over my previous"allegedly 30%" brighter bulbs. They certainly light up the road just as the advert says. Also delivery and packaging from Powerbulbs was really good and the bulbs arrived in good time. Thumb up for powerbulb to send me the bulb promptly! Nice bright bulb. Really loving it. I've purchased these before and they are the best I've tried. They last about 22 months and at £20 a pair discounted are well worth it. I would recommend to anyone. These bulbs are a major improvement on my original bulbs. Make driving at night safer. - Light output is far whiter,more powerful and the distance of throw seems further. For me,well worth the money. Noticeable brighter than even +130 percent brighter bulbs. Last about 22 months before expiring which is allowable for the brightness. Excellent. I am impressed by its performance. It is actually brighter as its claim by 150% that the coverage of the headlamp is now 150% wider. Totally impressive. Fitted to my daughters fiesta 08. Big improvement. Power Bulbs have been great! Very helpful and the web site is easy to use. I was kept informed and the bulbs arrived on the stated delivery date. The bulbs are very good indeed, not quite as bright as the HID units I have replaced but not far off and I now have a beam pattern once more. I am very pleased so far, it will be interesting to see how long they last. I have tried a few different bulbs from Sylvania recently but these Phillip's Night Racing bulbs are the only ones that have noticibly improved the brightness and side visibility when driving at night. These globes are much brighter than standard globes so they live up to claims, low beam is white and high is more blue, what does concern me is the life expectancy according to the manufacturer is only 150 hrs. Had I know that I would have looked at others, Oh well we will see how long they last. Arrived after 14 days. The light is very white which is great. It is definitely much brighter than original. I now probably won’t need my extra spotlight. I had not realise at the time of purchase that their warranted life was only six months. Had I noticed this, I probably would’ve bought the next model down of Phillips as it had the longer warranty. We’ll see how long It lasts my original OEM lights are 11 years old without failing. However the extra brightness worth it and I have kept the original bolbs in the car in the unlikely event that they fail ta long trip . I am very happy with this purchase and the price is roughly half that of the retail outlets in Australia. The price is right and the goods are right. what more can you say. Recommended. Well worth buying. Fast delivery and well packaged. The difference between the old bulbs and the new ones is immense. I can actually see where I’m going on the unlit country roads. Really struggling at night with the standard H4's. Now I can see where I'm going. The difference is quite something. Well worth the cost and very well packaged. Good delivery. These bulbs are easy to fit and are so much better and brighter than my original headlamps. Makes night driving so much easier and safer. My old 52 plate Forester's lights werent the best. Took old bulbs out (also Philips) popped these in. What a difference, main beam especially, good wide field on dip. Quick delivery and ok price with discount code. These are really good, big improvement on the originals. Much whiter and brighter, so much so that I have had now to buy Philips White vision bulbs for the sidelights as the originals were made to look dull and yellowy in comparison! Amazing price on a top of the line product. Unbeatable value. Fast shipping to Canada. Have purchased from PowerBulbs in the past and will continue to do so in the future. Philips Racing Vision bulbs are nice upgrades over standard halogen bulbs. It is bit more whitish and brighter compared to Xtreme vision.Gives an effect somewhat like projector lamps. However , bulbs shows it true performance when they get heated up after few minutes. Descent highway performance. Packaging from philips could have been better, bulbs were not properly fixed in the slots and had given few scratches in the case from the bulbs tip. Thanks Powerbulbs. Driving the wife car found how poor the light were, put in the the Philips Racing Vision H4, now freeze rabbits at 200 Meters!! Come across this sight by chance and after going through it decided to order the Philips Racing Vision. My Experience has been excellent, the delivery a little delayed (probably die to Indian Postal service handling imported goods) and any mail sent promptly responded to. Will definitely love to deal with them again. CHANGE UP, FROM "NIGHT BREAKER TO THESE 150%+ PHILIPS RACING, "WAY BETTER" ON DIPPED, AS NOT FUSSED ON FULL BEAL AS I HAVE 2 X LED SPOTS AND LED BAR ON BULL BAR AND 52" WINDSCREEN LED BAR! .......AS, I USE JEEP AT NIGHT ONLY FOR HUNTING, "PROB, CAN SEE FROM THE MOON, LOL(total led output is over 120,000 lumens" BUT, YEP PHILIPS RAVING WELL WORTH THE SPEND!! Fast delivery and a very good product. Price very reasonable. Happy with that. These bulbs are very good..little difference between night breaker laser. .both good bulbs. Very bright light ,next time i will buy this bulb again. 5 Real Performance to back the claims! All I have to say is WOW!!! I can't believe the difference in overall light output. I had the Osram Nightbreaker Unlimited H4 bulbs in my 2015 Tacoma before these. Those were a great improvement over the OEM bulbs. But these Philips Racing Visions are noticeably better than the Osram. Everything is more well lit. The distance and width are much better, I can see in the ditches better now too. I was considering a retrofit, but I think I'll hold off for quite some time now. For comparison my bike has a modded Morimoto d2s 4.0 retrofit on a 35w ballast and it's awesome, but for vs 0+ I can deal with difference. I don't know if the value vs performance can really justify ia retrofit now. Note: this is on a vehicle that has a decent beam pattern/optics, if your vechicle has a poor beam pattern/optics then there is no swapable bulb that will cure a poor design. In that case a retrofit is needed. I've tried whitish headlights, bluish headlights and I've had the extreme vision +130% for years but this RacingVision H4s are the best. Illuminates the road brighter and further, makes my early morning drive to work much more safer and more relaxed! The service provided and the product quality is excellent, couldn't ask for more. Love the bulbs, Philips is the best. Hello, Quite satisfied by its performance. Good brightness and excellent white light color. And over-n-above, praise worthy delivery commitment by PowerBulbs. Thanks. These are simply the best H4 bulbs I've ever used. Being 150% output I might be dissapointed with their longevity, but the output is impressive. Fitted to Ford Ranger 2012. Good improvement on low beam, high beam not any better - possibly worse. This could be because of the rally effect. Would buy again depending on how long they last. Great product. Very good service. 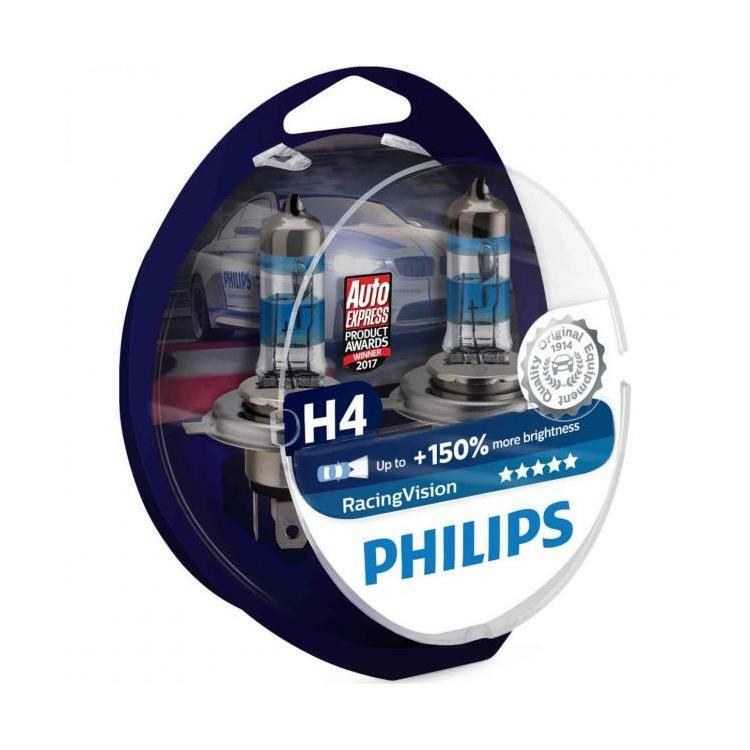 I am located in India and bought the Philips RacingVision bulb few weeks back. Bulb was delivered within 2 weeks. Packaging was ok ok (not up to Amazon standards!) but bulbs were in good shape. Thanks for the great service! These Racing Vision bulbs are a noticeable step up from my standard globes in the WRX. Also worth mentioning is the great value and service from Powerbulbs. These H4 bulbs are noticeably brighter than the +100% brighter Philips bulbs I had before and brighter than anything I have tried to date. Very white and great vision. Highly recommended. An excellent pair of bulbs from PowerBulbs. Many thanks to their staff for their help! Bought for my classic Spitfire. Much better than the cheap H4s supplied with the halogen convetsion kit. Now I can see safely at night. Good cut off and just white enough. These made a huge diffeence to our new R56 MINI Cooper. Please let them be available in HB4. 5 Night driving for older cars. Excellent - what a difference they have made. The 150% light really works and it now makes driving at night so much easier. I have a 23 year old car and you can imagine the 'candle' power that I have been driving on for some time!! Just as envisaged by way of reviews on the internet. 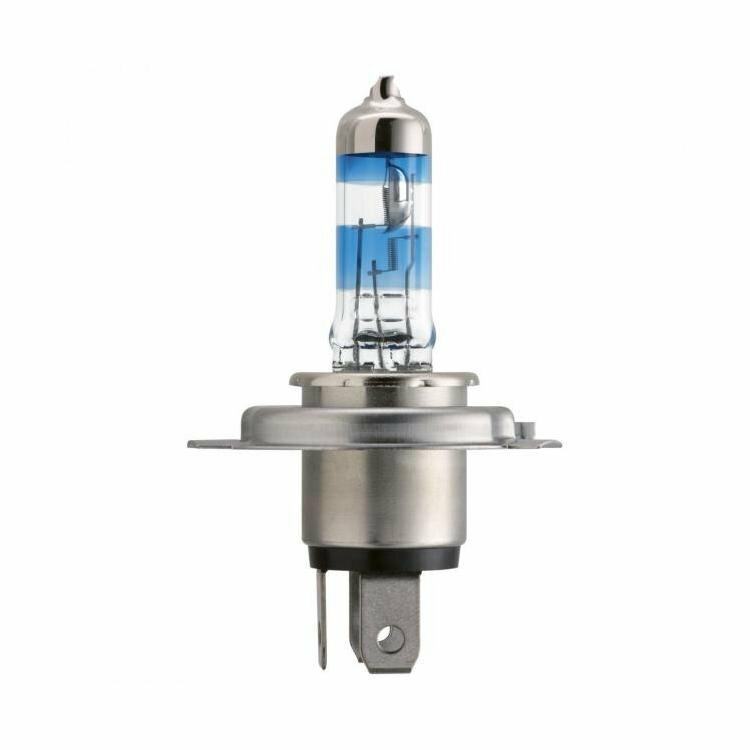 By and far the best stock halogen replacement bulbs available in the market. Although the life is lesser than other performance bulbs; it is something that will have to be seen. Great price and great performance. These bulbs are extremely bright. I travel alot on country roads with no street lighting. These are perfect to give you that little bit extra distance in being able to see what's ahead. 5 Philips Racing Vision H4. Those bulbs are so bright, yoy don't need extra light's on your car. Definetly i am gooing to order on set more, worth all money. Having tried a few different bulbs in the past, I found these worked well. They were bought for my VW T4 which does have the wiring upgrade loom, but also have fly-eye covering the headlights. With these bulbs I can see fairly well now when dark. 5 The brightest bulbs ever!! Normal H4 socket, so no extra wiring required. Fantastic bulbs with wider and longer throw compared to stock bulbs. Thanks to Powerbulbs.com for enabling me to use these bulbs. The Philips RacingVision is great bulbs when you want good light on the road. I like the performance and light colour of these bulbs. I can recommend Philips bulbs as they are quality bulbs. My 3rd time ordering with PWB. No hassle and items were shipped promptly. Item were professionally packed and received with no issue.